If you got greater than four correct, excellent. I think I vaguely knew who Whistler was, but not the details of when he lived and what he did. So I flunked. I understood the talk well enough, but it took a bit of research on the Web later to really understand the subtleties. The main goal of the talk was to show how the Garden of Eden in Venice fit with the Aesthetic movement goals. Unstated, but I’ll conjecture since I put way too much research time in this, that the future of the garden as well (reverting back to nature) might be considered fitting as well with the movement. · Garden of Eden in Venice – A 9 or so acre garden in Venice (the Giudecca island to be exact) – which is amazing considering the size of Venice. It was and still is the largest private garden in Venice. It’s located here – though the satellite image really doesn’t reveal much. The garden took form at the end of the 19th century under the owners Frederick and Caroline Eden. Frederick Eden wrote the book A Garden in Venice originally published in 1903 describing the garden. The garden was a famous stopping spot for the intellectual jet set (who, it can be assumed, had more cultural literacy than I do). After the death of the owners, the garden passed through a series of different hands eventually being bought by the Austrian artist Friedensreich Hundertwasser (1928 – 2000) who let it go back to nature and it looks like that’s the way it will remain for now. Considering Hundertwasser’s goal of reconciling humans with nature I guess it makes some kind of sense. · Hypnerotomachia Poliphili – a book published in 1499 and widely considered one of the most beautifully illustrated among incunabula (i.e. books printed before 1501). · James Abbott McNeill Whistler (1834 – 1903) – an American-born, British-based artist who was part of the Aesthetic movement. You might be familiar with his painting Whistler’s Mother, 1871. · Gertrude Jekyll (1843 – 1932) – a famous British garden designer. Her family name was used in the famous novella Dr. Jekyll and Mr. Hyde. Her sister, Caroline, was the wife of Frederick Eden – owners of the Garden of Eden in Venice. · Gordon Bennett, Jr. (1841 – 1918) – a wealthy American newspaper publisher. It was said that he carried dairy cows on his yacht and one or more those cows ended up at the Garden of Eden in Venice. The Garden of Eden produced milk for a while (this statement sounds odd!). · Walter Pater (1839 – 1894) – an English essayist and art and literary critic. His essays published in 1867-68 were important for setting the tone of the Aesthetic movement: live life intensely and follow ideals of beauty. · Sissinghurst Castle Garden – an English garden created in the 1930s that represents a quintessential example of an English garden. The garden layout was influenced by Gertrude Jekyll (did you forgot who that was already?). 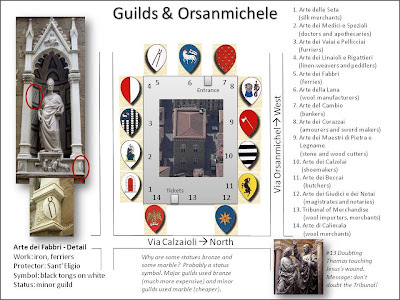 Travelmarx created the above diagram to help understand how the Orsanmichele in Florence relates to the guilds of Florence. Warning: there could be inaccuracies in it – we're not Renaissance scholars or something. You can’t help but pass by the Orsanmichele at least once while in Florence and notice the very odd cube-of-a-building with all the statues on the outside. What’s this building doing here in the middle of city and what are all those statues on the façades? Read on. The Orsanmichele was the church of the guilds. The guilds were Florentine associations of craftsmen and tradesmen that began to form in the 1100s in Florence, across Italy and Europe. (The height of the guilds in Florence was in the 13th and 14th centuries.) For example, the “Arte del Cambio” or the banker’s guild would be the guild you belong to if you were a banker, like the Medici. There were seven major guilds and 14 minor guilds. The difference between major and minor guilds probably was related to the clout the guild had and how important the guild was to bringing money to the city. Each guild has a patron saint. For the banker’s guild it is St. Matthew because he was a tax collector before an evangelist (quite the career change, huh?). Each guild had a coat of arms (or in Italian a “stemma”) that helps everyone, especially the illiterate to understand who a particular building belonged to or who sponsored a piece of artwork. Our appointments for the permesso di soggiorno were today at 11:50 and 11:55am. The office is located at Via della Fortezza, 17 – near the Fortezza da Basso. Our thinking was that we would show some courtesy and show up 10 minutes early and everything would go fine. Well, we arrived took numbers B219 and B220 and walked into a large room of 200+ other people waiting. A glance at the ticket board indicated that they were serving B153. It took 10 minutes to get to B154. Some quick math indicated that we could be waiting as long as 10 hours. In reality, probably more like 3 hours. However, we had other things to do. When you walk into the Questura, you stop at the sportello (glass window) and show the person there your letter. That person hands you a ticket. If you can’t make the date your letter has indicated, you can’t just show up the next day. You have to consult a table and figure out the next appropriate day to come. It works like this: you pick the column in the table (see photo) that corresponds to the date you were summoned. 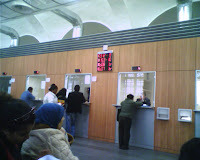 Then you choose the row based on what month you were summoned. That indicates the week and day of the next month you are to return. So for April 28th then next return date is venerdi (Friday) of the 2nd settimana del mese (the 2nd week of the month) = May 16th. Complicated? Lesson: regardless of the time you ticket shows, we would recommend going earlier unless you don't mind waiting. In the least, bring something to do. If the "guard" won't give you a ticket because you are too early - tell him you have an appointment and need to get through early? We called it off and went for a little stroll and a bollito sandwich. I guess we’ll return on the 16th very early to pull a number. Maybe we’ll bring some knitting. We might try this afternoon after 3pm. The office takes lunch between 2 and 3 we were told. April 25th is Liberation Day in Italy and is a fixed (not moveable) public holiday. 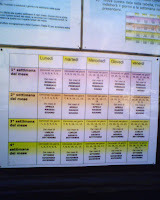 (See public holidays in Italy.) It celebrates the end of World War II in Italy in 1945. This year it fell on Friday so everyone was taking a long weekend. Florence was packed to the gills. The weather has been fabulous so everyone is out walking and lounging in cafes. On the post Via Del Canneto Sounds we forgot to mention two important other bird sounds heard on this tiny street: blackbirds and mourning doves. Maybe they went somewhere for the winter or maybe our windows are open more or maybe we are just listening more, but these bird sounds are more obvious now than in the winter. 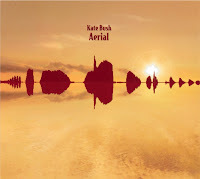 Every time we hear the blackbirds and doves in our mind Kate Bush’s double album Aerial gets switched on. On this album she uses these bird sounds. The mourning dove sound can be heard for example in Prelude, the song that starts the concept part of the double album. The blackbird sound can be heard on the sixth song of part two, Aerial Tal. The sound wave of the blackbird is in fact the album cover art. Travelmarx’s pick on the albums: Sunset. 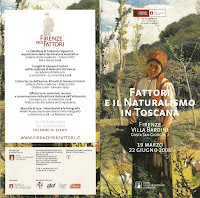 We caught the exhibit Fattori e Il Naturalismo in Toscana today at Villa Bardini. Fattori is the last name of the Italian artist Giovanni Fattori (1825 – 1908) who was the founder of the important Tuscan painting movement called Macchiaioli. 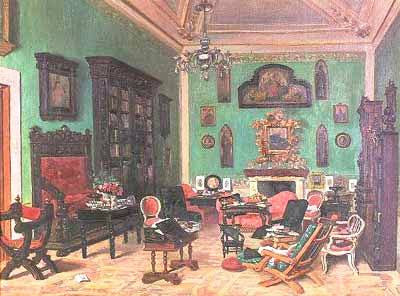 The Macchiaioli movement took place in the second half of the 19th century in Italy and is considered by some to be the forerunner of the Impressionist movement in France. The Macchiaioli painters painted nature as they saw it in the Tuscan countryside and even cities. The name of the movement derives from the word “macchia” or spot. The exhibit contains 35 paintings – many never on public display before. The Roberto Capucci exhibit can also be seen on the same entrance ticket but not the garden, unfortunately. Be sure to stop and enjoy the view from the top floors of the museum back on to the city. The Bardini museum sits quite a bit above the city, yet isn’t that far away. Vivoli is everyone’s guide book and is consequently packed (tourists and non-tourists). It opens onto a tiny, pleasant piazza, so what’s not to like. The gelato is often ranked as the best in Florence. We often stop by when in the neighborhood. Did you know you can get take-out in a small tub? It would be dangerous to have that around the house. GROM is a relatively new chain (founded in 2003 in Torino) that has good gelato as well. The chocolate-extra noir is very good and doesn’t have a drop of cream in it (if we understood and tasted correctly). It is located just south of the duomo’s campanile. It is usually packed as well. In the warmer months be sure to try a granita. We are hooked on the granita di mandorla (almond granita). Gelato La Carraia is our favorite in the San Frediano area. It is located at the south end of the Ponte Carraia bridge (2 bridges west of Ponte Vecchio). Here’s a map of all three shops. The Chiostro dello Scalzo is a small space that contains a series of monochrome frescoes by Andrea del Sarto. He worked on and off on the frescoes between 1507 and 1526 (except for two). They are interesting because you rarely see monochrome frescoes (at least we haven’t) and it gives an idea of the progression in an artist over twenty years. For reference, Michelangelo entered del Sarto’s studio as an apprentice in 1524. The cloister is located at Via Cavour, 69 just north of Piazza San Marco. It’s free to get in and is worth a stop if you are in this part of the historical center on a weekday morning. (You can easily combine this with the Cenacolo di Santa Apollonia which is nearby.) 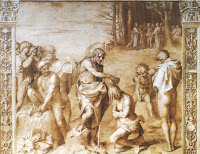 The space was used at one time by the Company of the Disciples of St. John the Baptist, nicknamed “dello Scalzo” because they would walk barefoot in processions. If you decide you want to get married in Florence, you can do it at the Palazzo Vecchio and hire people in Renaissance costume. We picked up this brochure the other day in the Office of the Calcio Storico Fiorentino. Looks to be about 52 Euro per character. So as to not look like a cheapskate, you should hire at least 8 characters. The woman on the brochure is Maddalena Doni. Her wedding portrait was painted by Raphael in 1506 and is in the Pitti Palace Galleria Palatina. She married Angelo Doni and it was quite the wedding or so we were told. Check out that necklace. For more on her “pose” see this post. The free exhibit Rosa dei Venti (Roses of the Wind) by the Italian artist Giampaolo Talani is in the Sala d’Arme (Weapons Room) of the Palazzo Vecchio. Basically, this is the north (original) entrance of the building. His work is familiar and vague at the same time. The colors and seemingly simple themes are very appealing. Talani is an expert in fresco painting and many of the works on exhibit have the look of a fresco without being one. He produced the very large mural for the Santa Maria Novella train station (Florence’s main station) called Departures. (Travelmarx is ashamed to say that we are not sure we can recall the mural at this moment, but promise to pop in and check it out ASAP.) The Talani show runs from March 7th to April 27th 2008. 10:30 - 6:30 every day. The exhibit Cina – Alla Corte Degli Imperatore (China – In the Court of the Emperors) is at the Palazzo Strozzi, Florence from 7 March to 8 June, 2008. The Palazzo Strozzi is a beautiful Renaissance palazzo to see an exhibit in. The lighting and the signage are good. The exhibit space is on the piano nobile (next floor above ground floor) in a series of eight rooms around the main courtyard. The courtyard has a huge Buddha greeting you as you enter the palazzo from the west. 10 Euros for a ticket. The exhibit focuses on the Han Dynasty (23 – 220) and Tang Dynasty (617 – 907). The Tang Dynasty was considered “l’età d’oro cinese” (the golden age of China) when there was a period of progress and stability. We liked the exhibit and learned a little about Tang Dynasty. I think we can tell the difference between a Buddha (big ears, simply dressed?) and Bodhisattva (usually with jewelry?) now and understand how strangers were portrayed (long noses and goatees?). One interesting point was brought up in the audio guide (5 Euros) on a group of statues of women riding horses: that women’s rights during the Tang era were fairly liberal compared to later periods or other countries at the time. For example, the three statues showed the women riding horses astride in the saddle and not sidesaddle. 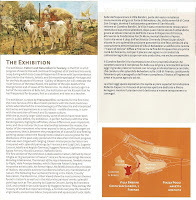 For more information go to the exhibit site at http://www.cinamaivistafirenze.it/. 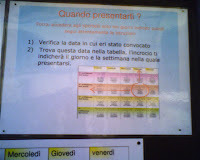 In the Strozzina there was an exhibit called Cina Cina Cina! – Arte Contemporanea Cinese Oltre Il Mercato Globale (China China China! – Chinese Contemporary Art Beyond the Global Market). 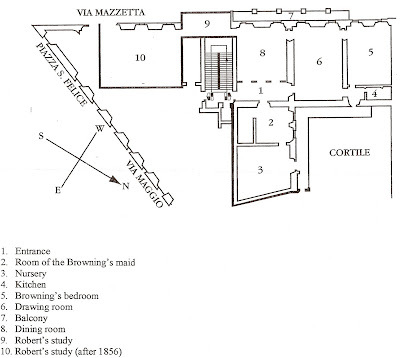 The Strozzina is basically the basement of the Palazzo Strozzi. It’s an odd space that lends itself to more modern shows, for example, the previous show Sistemi Emotivi. The current exhibit makes a lot of use of video, some banal, some spooky. The show tries to explore the question of what the China phenomenon is by looking through the eyes of three Chinese curators. The curators give the viewer a chance to see three points of view of how current Chinese artists are impacting the international art system. To tell you the truth, I didn’t get this until I reread the pamphlet for the show about five times later. And, I’m not sure the viewpoint came across to us. Maybe we were saturated from seeing the top floor exhibit and this was just too much? The previous shows in the Strozzi and Strozzina were Contro Moda and Sistemi Emotivi, respectively. I haven’t said anything about music for a while. Of course I’m still listening to music. I can’t go a day without it. I know I should be listening to Italian music more, but I haven’t. 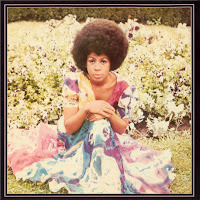 Instead I’ve been listening to way too much Minnie Riperton and Philip Glass. 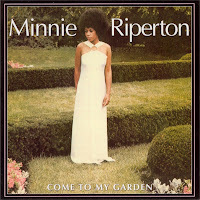 I don’t know why, but I’ve always loved Minnie Riperton’s first album “Come to My Garden” – every song is like a hidden pleasure. She had a cool, high voice before you know who. The album was released in one of those good years for music, 1969. Take a listen to the track titled “Memory Band”. 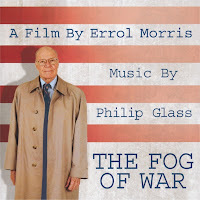 For Philip Glass, I’ve been listening to everything I own (which isn’t much, hint, hint), but the “Fog of War” soundtrack (2003) is my favorite for studying and thinking. Take a listen to the track titled “100,000 People”. By the way, what is transcendental realism? According to the Wikipedia page transcendental realism is an understanding that our minds are limited. (I guess I became a transcendental realist after expecting to master Italian after two months here only to find myself many months later still speaking like a baby.) 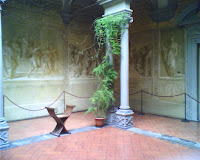 An exhibit of the artist Adi da Samraj is being hosted in the refectory of Ognissanti until June 22nd 2008. The juxtaposition of the modern art and last supper worked for us. To put the juxtaposition in perspective, the last supper fresco was completed in c. 1480. The art work by Samraj was completed, say in 2006. That’s a different of 520+ years. 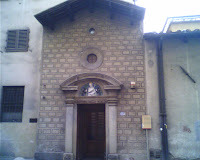 - Cenacolo di Santo Spirito. 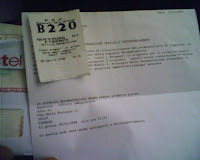 2,20 Euro entrance fee. Location: Piazza Santa Spirito, 29. Artist: Orcagna. - the apostles shared cutting boards? We drove over the Rio-Antirio Bridge on February 11th 2008 on our way from Nafplion to Delphi during our Greece trip. A little late to blog about it, but we wanted to show a picture of it. It is a gorgeous bridge. There are old fortresses on either side of the bridge. We stopped on the southern side at the Fortress of Rion which offers a nice view of the bridge. It was free to get in. (Not sure about the fort on the northern side.) The picture attached to this post is from that fortress. It cost us 12 Euros to cross over in a car. The church of Santi Apostoli is opens on Piazza del Limbo located just west of the Ponte Vecchio on the north side of the river. The brochure from the Archdiocese of Florence says it dates back to the 11th century – the great period of Florentine Romanesque. 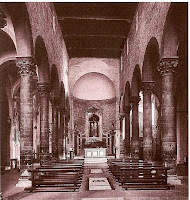 For me the church is interesting because it is simple, off the beaten track, and suggests a possible location that Brunelleschi drew his inspiration for his signature design in the Ospedali degli Innocenti, Santo Spirito, and San Lorenzo – the rounded arches ending on columns. At least, I can’t imagine how Brunelleschi would not know about the church and would not have looked at it (ditto on San Miniato). Vasari in is Lives of the Artists says as much – but then again, he didn’t quite always get it straight. It started when I was reviewing the lives of Ferdinando II and his brother (Cardinal) Leopoldo de’ Medici. I then stumbled onto something called the Accademia del Cimento which was a scientific academy founded by Galileo’s students to promote Galilean methods. The Accademia ran for about ten years between 1657 and 1667. The two Medici brothers help found the Accademia and its members met in the Pitti Palace. There is a lot of very interesting information at the Institute and Museum of the History of Science web site. Just type “vacui” or “torricelli” or “cimento” in the search box and start exploring. I’m embarrassed to say, we have not yet gone to this museum. It’s on the list. We’d heard that some of the exhibits were closed during some restoration so we’ve been putting it off. I’ve heard some refer disparagingly to the Baroque style as a form of horror vacui – fear of leaving any space undecorated. 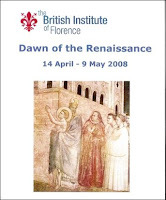 I just started the four week course Dawn of the Renaissance at the British Institute in Florence. I have already taken the four week course The High Italian Renaissance and the two week course The Medici: Power and Art of a Renaissance Dynasty. I think there will be some overlap of what I’ve learned already but I will use it to review and go deeper. For every two hours of class or tour, it takes me as long, if not longer, to retype the notes, add images, and add my own interesting tidbits. Along the way, there are thousands of little-side-streets-of-trivia to get lost in. For example, today I was reviewing some notes on the Medici and ended up on the Wikipedia page for Horror vacui. How did that happen? See this post. Here is a sample program for The High Renaissance course that has past. Note, times and places probably change every time the course is offered (several times a year) so only use this to get an idea of the pacing.